Emotional Freedom Techniques (EFT) centres on the theory that the cause of all negative emotions is a disruption in the body’s energy system and that this disruption causes the symptoms that bring people to therapy. Clinical EFT is an exciting technique that is becoming widely used to help overcome a wide range of psychological and physical problems. In its most basic form, it involves tapping eight key points that link to the main meridians in our energy system, while focusing on the problem to be solved. Clinical EFT is used to relieve anxiety, alleviate fears, cure phobias and “neutralise” unpleasant or traumatic memories, amongst many other things. It is an extraordinarily effective, quick, and gentle therapy: underlying issues that might need addressing tend to emerge swiftly and to be surprisingly speedily resolved. We know from brain imaging techniques such as MRI that when we stimulate the points used in EFT by tapping, it is the emotional part of the brain that “lights up” and activated. We also know that when we are talking it is the logical and the reasoning part of the brain that is active. In traditional talk therapy, we rely on the logical side of the brain to do the job. The connection (as in the neural pathways) between the logical and the emotional parts of the human brain is not at present particularly well developed. This is something we sort of know empirically: when overwhelmed by an emotion, it’s hard to be rational, sensible, and logical. What is so clever and unique about clinical EFT is that we are simultaneously activating the emotional part of the brain (by tapping the points) and engaging the logical side (by using words). The results are far swifter and more effective when we are firing on these two cylinders, rather than one. 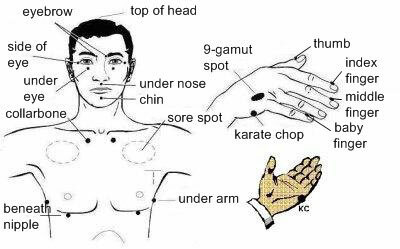 Practitioners use their fingertips (or have the client perform a tapping routine on themselves) to stimulate certain meridian energy points, on the head, face, hands and upper torso, as the client focuses on the problem or negative feelings they are harbouring. addictions, anger, anxiety, backache, eating disorders, compulsions, depression, fears, grief, guilt, insomnia, headaches, learning disabilities, low self esteem, migraines, nightmares, obsessions, panic attacks, pain management, performance anxiety, phobias, physical aches and pains, post-traumatic stress, resentment, sadness, shame, sports performance, and weight loss. You are doing Surrogate EFT when you tap on yourself for another person’s issue, whether or not they are present. This is an exciting element of EFT and points us toward levels of healing that are well beyond EFT, medicine and anything else this world has to offer. According to Gary Craig, founder of EFT(www.emofree.com), it is the springboard into higher levels of spiritual awareness. He says this because Surrogate EFT is not possible unless we are somehow connected. For example, how could you tap on yourself and generate relief for my headache unless there is some connection between us? The connection may not be visible, like an electric cord, but it is obviously there. According to Gary, this is glowing evidence of the Oneness principle that permeates so many spiritual doctrines. The mechanics of pulling this off are quite simple. No need to spend time “getting into the space” of someone else. Just make the mental assumption that you are someone else. You can do this in less than a second. Then begin using EFT for those issues just as though you were the other person. You can also have entire groups tap for someone else’s issue and this can add some power to the process. Certain uses should be obvious. Examples would be animals, pre-verbal children and people for whom you have little or no access (e.g. prisoners, mentally incapacitated people, people who are sleeping or in a coma or undergoing surgery). You won’t have information on their Specific Events unless you have such knowledge prior to using EFT. However, you can imagine these foundational roots and you might be surprised at how successful this can be. The process is particularly good for physical discomforts. If a dog, for example, is limping with a hurt paw, you can simply assume you are the dog and use EFT surrogately as though your “paw” was hurting. There’s a good chance the pain will improve or vanish altogether. Crying babies on airplanes can also benefit from this process. Gary Craig has done this many times with a success ratio quite high (80% or so). It has also been successful for Specific Events. If the clients are able to tell the therapist their Specific Events, this one can tap on her/himself surrogately and, upon testing, the stings of their Specific Events usually fade or vanish. This is yet another way of helping a client through their issues with minimal pain. Another use is for those clients who think this tapping process is silly and thus rebel against it. To them, EFT isn’t “real therapy.” In such cases, the therapist can perform standard talk therapy while mentally tapping her/his own EFT points on their behalf. This take some practice, of course, but how much better the talk therapy sessions progress. “But don’t I need permission to do this?”, you might ask. “Shouldn’t I get an OK from the clients, or God or the Universe?” Well, sure, if you think it is really necessary. However, You must not bother with this because you will never see any negative results from this process. The worst seen is “no result.” It’s as if there is a built in barrier that doesn’t allow healing if it is deemed inappropriate by the clients’ systems.